I love his sweetness and the delicate features of his face! For the coloring I used the Ink Distress. For the card I used a patterned polka dot paper with a black background, a pink patterned paper on which I inserted some stickers, purple sketches and finally I glued the wonderful Winter Charlie!!! 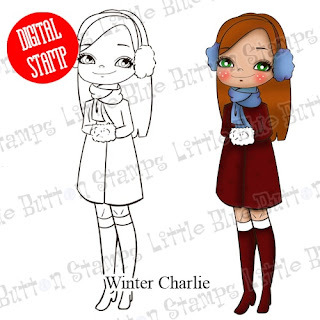 You can buy Winter Charlie in the shop!